How Much Does HBO Pay MarkMonitor To Send DMCA Notices Removing Its Official Content From Google? We've seen plenty of ridiculous stories about bogus DMCA takedowns, but none get so ridiculous as the ones in which the content being demanded taken down is the officially released content. This often happens because of shoddy / clueless middlemen, as is the case with the latest example being passed around. 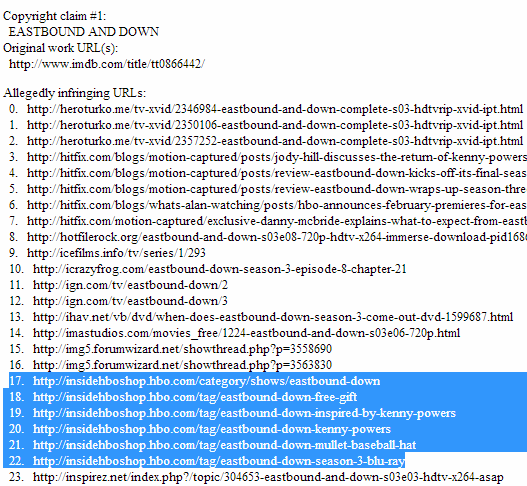 HBO hired DtecNet / MarkMonitor to keep infringing copies of its works offline, and as TorrentFreak notes, the company sought to achieve this by sending a DMCA takedown notice to Google that demanded the removal of links to HBO's own website (as well as links to legitimate sites that included reviews of the show in question, Eastbound and Down). Again, this kind of thing seems to happen all the time, once again confirming the key point that despite all the talk by maximalists that Google should just "know" when a work is infringing, copyright holders' own representatives have absolutely no clue at all, and that should weigh against the idea that Google or any other third party might magically know. My real question, though, is just how much is HBO paying DtecNet / MarkMonitor for this "service"? Not only is it making a complete mockery of HBO itself, but potentially killing search engine optimization value that HBO might have towards its legit and authorized content. Also, isn't it comforting that DtecNet / MarkMonitor are going to be the ones responsible for going after people under the new six strikes program? Stories like this really add confidence to the idea that they're going to make a complete mess of the whole thing. Dear hbo.com: You have been accused of infringing copyright 6 times (items 17-22 on the above list.) Per our Six Strikes program, your Internet will now be cut off. Have a nice day. Re: And so what if there are glitches? What I really want to know is if ISP's are opening themselves up to secondary liability by accepting six strikes. Their status as an indifferent provider has been compromised. Further, where is the content industries' acknowledgement of individual accountability? If they've got proof, and the presumption of guilt on their side, why not sue infringers directly? If they started convicting boatloads of infringers, then illegal file sharing would surely drop precipitously. It's a slam dunk, right bobby?